Teams with a new man in charge went 0-7 in Week 1, the worst start by a group of new head coaches in NFL history. The previous worst was 0-6 in 2001. It took Aaron Rodgers coming back from a knee injury and leading the Packers back from a 20-0 deficit to spoil Matt Nagy’s debut for Chicago. 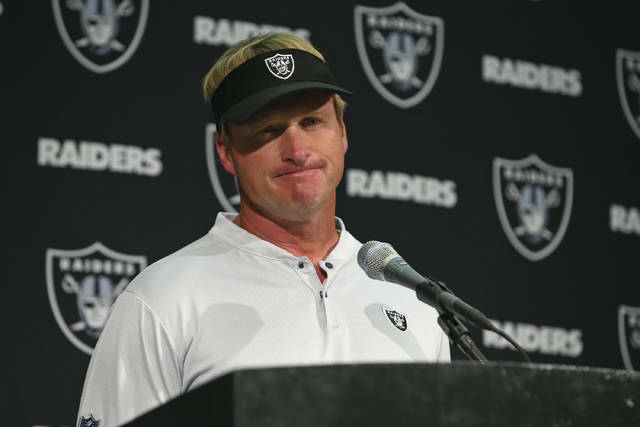 Jon Gruden returned to Oakland and his Raiders had a 13-10 halftime lead before the Los Angeles Rams turned it into a rout in the second half. 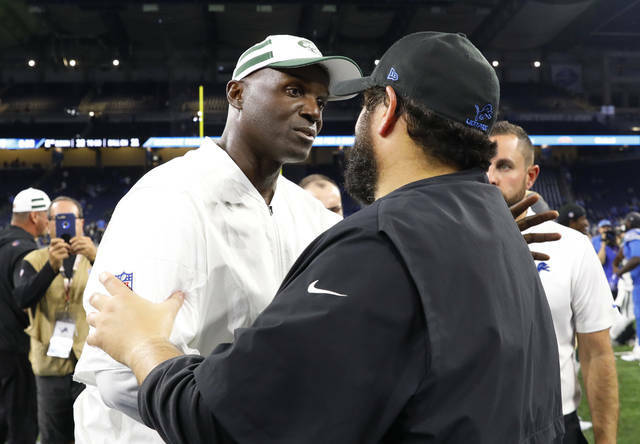 Matt Patricia endured the worst loss of the seven new guys when rookie Sam Darnold and the New York Jets whipped Detroit 48-17. The Lions can only hope Patricia fares better than other members of Bill Belichick’s coaching tree did after leaving New England. Arizona’s Steve Wilks didn’t have a chance against Washington. Andrew Luck’s return for the Colts didn’t help Frank Reich earn a win against the Bengals. Eli Manning’s pick-6 ruined Pat Shurmur’s opener with the Giants. Mike Vrabel and the Titans endured long weather delays in a loss at Miami. None of the seven teams play each other this week, so 0-2 is still on the table for all the new coaches. SO MUCH YELLOW: The first weekend saw more penalties (255) and penalty yards (2,254) than any Week 1 since the NFL expanded to 32 teams in 2002. The Falcons led the way with 15 in an 18-12 loss to Philadelphia. The Eagles and three other teams had 11. The Steelers had 12. The Raiders had the most penalty yards with 155. SCORING OUTPUT: The 765 total points were third-most in a Week 1. The Jets and Buccaneers led the way with 48 and the Ravens had 47. TAKE IT TO THE HOUSE: The 12 return touchdowns in Week 1 were the second-most in an opening week since the 1970 merger. There were 13 in 2011. The Jets had two return touchdowns and became the third team to score a touchdown on a pass, rush, interception and punt return in an opener. The Dolphins and Titans had TD returns on kickoffs in the same game, the 10th time that’s happened since the merger. DOWN TO THE FINISH: Ten of the 16 games were decided by eight points or fewer and four teams — Cincinnati, Denver, Green Bay and Philadelphia — had comebacks in the fourth quarter. DO IT ALL: Khalil Mack had his second game with a forced fumble, fumble recovery, pick-6 and sack in his first game for the Bears. He also did it against Carolina in 2016 while with Oakland. Charles Woodson in 2009 was the only other player to do it since sacks became an official stat. SIZING THINGS UP: The Giants, Eagles and 49ers each have 13 players weighing less than 200 pounds. The Steelers have 14 players weighing more than 300 pounds. CRIMSON TIDE TAKEOVER: Alabama led the way among colleges with 44 players on active rosters for Week 1. LSU was second with 40. Florida had 37, Miami and Ohio State each had 36. MISLEADING STAT: Tampa Bay allowed the second-most yards passing (475) but it doesn’t mean the Bucs have the second-worst pass defense. The Buccaneers built a 24-point lead over New Orleans and forced Drew Brees to throw nearly every down to try to catch up. Tampa Bay held on for a 48-40 win. THAT’S SO BROWNS: Since the merger, teams that are plus-five in turnover margin are 403-17-3. Doesn’t help the Browns, though. They’re only 2-2-1 in those instances following a tie against the Steelers. AGE MATTERS: The Raiders have the oldest team in the league with an average age of 27.6 years old. The Browns are the youngest at 25.2. FOREVER YOUNG: Tom Brady became the third player to throw a TD pass in a season-opening game at age 41 or older, joining Pro Football Hall of Famers George Blanda and Warren Moon. THE PERCENTAGES: Since the NFL went to a 16-game schedule in 1978, 52.1 percent of teams that won the season opener went to the playoffs while only 23.9 percent that lost reached the postseason.